The teleprompters are the devices which consist of one or more screen with a reflecting glass pivoted at a specific angle suitable for the reader or the narrator to see and read a script from the reflecting glass. Commonly all the standard designs of teleprompter systems comprise of the screen and reflecting glass of the same size. Reflecting glasses are nothing but specialized glass which is partially opaque and majorly transparent. The industry standard for such glasses is 70:30 i.e. 70% transparent and 30% opaque. The size of the electronic screen and the corresponding reflecting glass plays an important role in deciding the utility and the quality of the video recorded through the system. The more is the screen size, the easier is for the user to use the system for seamless and natural delivery of the information. Prominent models of Teleprompters consist of screens ranging from 12” to 19”. Greater is the screen size, the script can be viewed from a greater distance. In the same fashion, a greater screen sized teleprompter system enables the recording camera, mounted at the rear of the reflecting glass, to capture a larger view of the behind and around of the speaker in the front. Thus, an animated or live screen placed just behind the speaker can be captured from a larger screened system. Eye strain – A large screen teleprompter system helps the reader to read a script from a greater distance and with ease. This reduces the eye strain of the reader reading the script for a longer period of time. Larger view-capture – Since a large screen teleprompter can be placed at a good distance from the reader, it can be placed at a good distance form the reader. It can capture a greater view of the back and around of the reader. Eye-ball tracking – A small screened system required to be placed near the reader to have a clear view of the script. A good quality camera placed just behind the system, thus, captures the smaller details of the movement of the eyeball of the reader. This curtails the quality of the video to be less natural, which is the main aim of using such a teleprompter system. In media channels where news is read for television broadcast use larger screened system to have a larger view of the back and around of the news reader. Such news readers use a background LED wall or a large view screen to show the live view of figures of discussion corresponding to the news topic. With the help of a large screen teleprompter, such background screens can be captured easily and clearly along with the presenter. In schools and colleges of today’s world have media labs which produce multimedia contents for studies and teachers training. 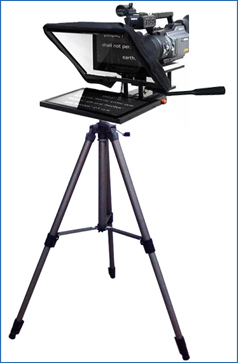 Teleprompters are used to record educational videos and lessons for the students and teachers. A large screened system enables the presenter to include a number of objects into his video to illustrate the concepts such as books, articles, objects, specimens, etc. which can be recorded directly and in a simulation with lessons. In India, teleprompter systems are used by political officers and higher ranked officers of Govt. Offices to record messages for the people or television broadcasts. Most of the Govt. officials and political leaders of such rank are aged to have weak eyesight. Use of big screen teleprompter system for such officials becomes a mandate for helping them to read the script easily and without much strain on their eyes. At EAPL, we manufacture such large screen teleprompters ranging from 19” to 32”. This is owing to a large number of feedbacks from the client and continuous research in the area to provide a more convenient model. In the past, such large screens were only restricted to use in news channels or live to report. Under the ‘make-in-India’ concept, we have been manufacturing and supplying such large screen teleprompter systems to a large number of reputed clients in a commercial price range.